The leader of a troupe of actors in Rome, Genesius was a gifted actor, comedian and playwright. The emperor Diocletian, who was persecuting Christians, was known to visit the theater. Genesius, who was a pagan, had an idea to win himself favor. He wrote a play that made fun of the Christian faith, thinking the emperor would love it as he was coming into the city to celebrate 20 years as emperor. Genesius even pretended to be a convert and approached the Christians in the city who were hiding in fear of their lives. He learned about their faith so he could write and act in the play to make fun of them. The emperor was present at the performance and Genesius was playing his role, poking fun at baptism. The only problem was, as the play went on, Genesius couldn't stop thinking about what he learned from the Christians. Suddenly right in the middle of the play, it all made sense to him and he believed in Jesus. Right on stage he began to profess his faith. He even addressed the emperor himself, inviting him to embrace the truth of Christianity. The emperor was enraged and Genesius was arrested. He refused to take back his words even when tortured and was put to death. Though he wasn't a Christian long, Genesius was certainly a brave one. His feast day is August 15. St. Genesius died somewhere between 286 and 303 AD. The exact date is not known, neither is the date of when Genesius was born. 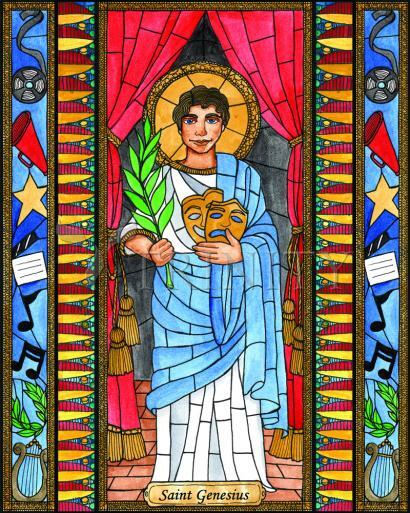 St. Genesius was an actor in Rome, having performed for Emperor Diocletian. One of the plays that he would perform was a play about a catechumen that was to be baptized satirizing the Christian sacrament. However, in a weird string of events during the play, Genesius was converted to Christianity during a performance. It was during the performance that Genesius proclaimed that he saw angels around him and had asked these angels to baptize him during the performance. This outraged the Emperor who had him tortured to force Genesius to renounce the Christian faith and return to idolizing the pagan gods. Genesius was faithful which ultimately resulted in him being beheaded. However, the above description of how he converted is thought to only be a legend. The legend of Saint Genesius of Rome was first dramatized during the 15th century, then later on in the works of oratorio Plus Atella of Lowe, and then most recently again by Weingartner. Again, the thought is that this is a legend, and that Genesius' existence is even questioned, but was venerated in Rome during the fourth century when a church was built in his honor and repaired by Pope Gregory III in 741. He is also thought to be the counterpart of St. Gelasius of Hierapolis who died in 297AD. St. Genesius was buried in Rome within the cemetery of St. Hippolytus, which is on the Via Tiburtina. The relics of St. Genesius is thought to be scattered in a few different places-San Giovanni della Pigna, the chapel of St. Lawrence, and Santa Susanna di Termini. There are several different stories that surround St. Genesius. There is one source that claims he was a legal clerk that left his position in search of baptism. Another claim is that he was a cult following out of Arles that eventually spread to Rome where a church was built. The last story is that St. Genesius was a comedian and was converted during a performance and refused to renounce his Christian conversion at the request of Emperor and was subsequently beheaded. The latter was a story that began no later than the 6th century. Regardless of how Saint Genesius of Rome converted to Christianity, he died a martyr and became known as a patron of saints to actors, comedians, converts, dancers, musicians, printers, lawyers, epileptics, thieves, torture victims and attorneys. His feast day is the 25th of August and his basilica at Arles is on the 16th of December.